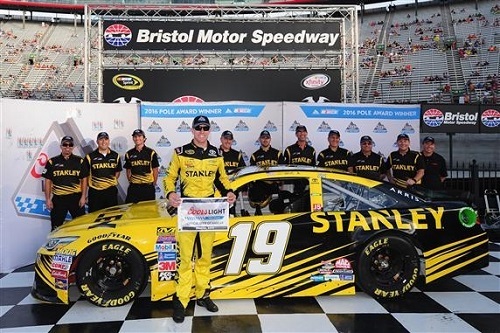 Carl Edwards wins the pole for the Bass Bro Shops NRA Night race at Bristol Motor Speedway on Aug. 19, 2016 (photo courtesy of Getty Images for NASCAR). Carl Edwards swept 2016 NASCAR Sprint Cup Series poles at Bristol (Ten.) Motor Speedway, most recently posting a 14.602-second/131.407 mph lap on Friday in the third of three rounds of qualifying for Saturday night’s Bass Pro Shops NRA Night Race. It was his fifth pole of the season. Joe Gibbs Racing dominated qualifying and, as a result, dominate the top-five of the race starting grid. Edwards will share front row with teammate Denny Hamlin Kyle Busch will start third. All four JGR drivers qualified in the top-five, as Matt Kenseth took fifth. Joe Gibbs Racing boasted the fastest two cars in each round. Hamlin led the way in rounds one and two, and his 14.573-second/131.558 mph lap in the opening round set a new track record, breaking his own record from a year ago. Busch was second to his teammate in round one. In round two, though, Kenseth was second to Hamlin. The only non-JGR driver to qualify in the top-five was Sprint Cup Series rookie Ryan Blaney in fourth.